A Flexible Film Isolator mounted on a stainless steel adjustable trolley system with capacity to hold 20, 30 or 50 cages. 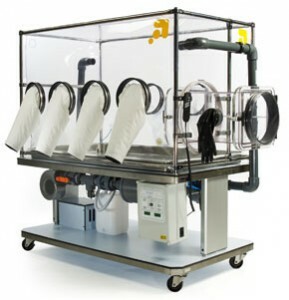 Isolators are available with 4 front and 2 rear gloves or 2 front and 2 rear gloves. We can also make bespoke units to suit your specific requirements.